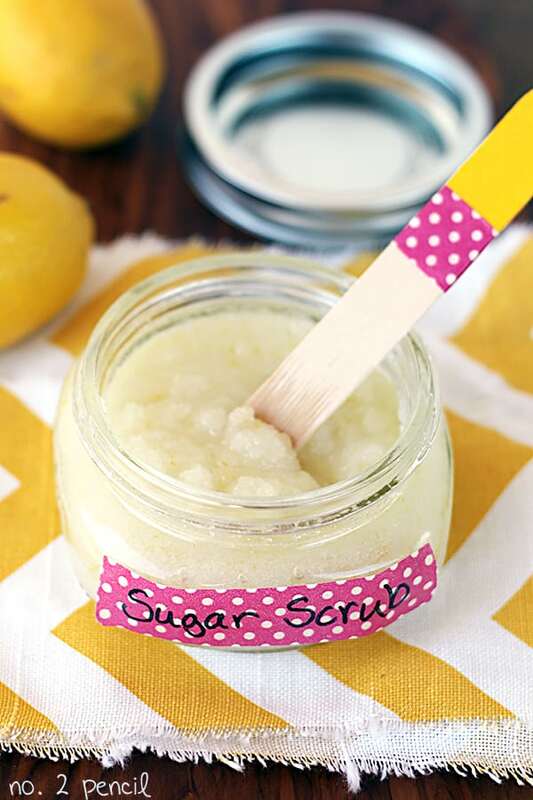 This recipe for Homemade Sugar Scrub is so easy to make, and it makes your skin feel absolutely amazing. My homemade sugar scrub is a simple combination of coconut oil, sugar and lemon zest. Like my DIY Face Scrub, these are just everyday ingredients that you likely have on hand already! The combination of lemon zest and coconut oil smells heavenly. The coconut oil leaves your skin so soft and smooth. It’s a homemade exfoliating and hydrating treatment in one. 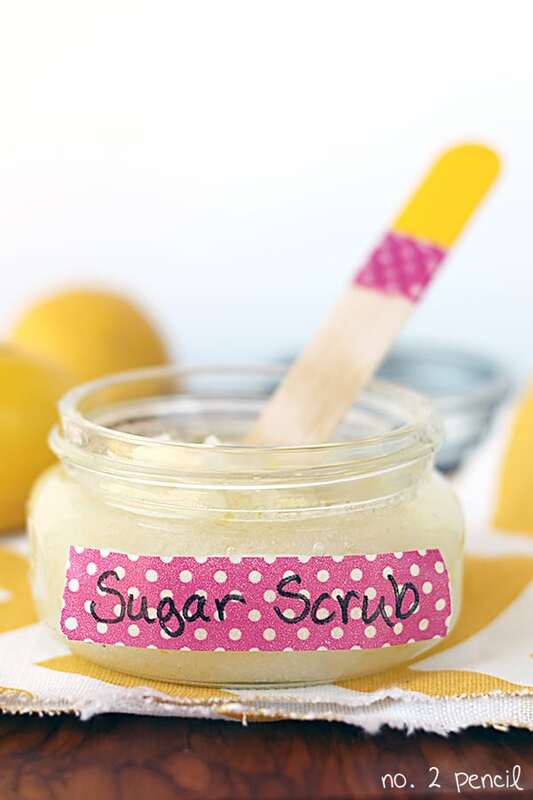 This homemade sugar scrub is my new favorite gift idea. Bonus: It looks adorable in these little mason jars. Stir together coconut oil, sugar and lemon zest. Pair this with Handmade Lemon Soap from a Pumpkin and a Princess for a gorgeous DIY gift set! Coconut oil liquifies when it gets warm and is solid when cool. You can use it in the scrub either way. Take care when using in the shower as it can make the shower a little slippery. This recipe is intended for use as a body scrub. I am absolutely loving coconut oil right now, so expect to see more coconut oil projects and recipes. In addition to cooking, I’ve been using it as a moisturizer and to smooth and shine my hair! I’m loving coconut oil right now too and can’t get enough! It’s so great for your skin. Can’t wait to try this! Can’t wait to make this! Where did u buy the jars? I bought jars these at Target. They are a smaller size Ball Mason jar. I found a 4 pack in the kitchen supply area. Where did you buy the coconut oil? I assume it’s pure and not hydrogenated or something? I bought a big container of pure coconut oil at Costco. You can also get a smaller one at Trader Joe’s. When you are making the scrub, is your coconut oil in liquid form or solid? I always measure mine in liquid form, but I did not want it to melt the sugar. Thanks. I’ve done it both ways depending on the temperature in the room. It won’t melt the sugar as long as the oil isn’t heated. Have fun! 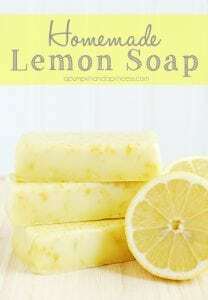 I just made a double batch of this and can’t wait to use it! 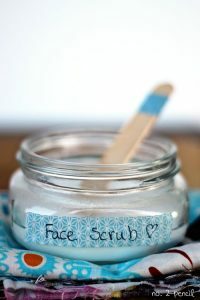 We have been using cold pressed coconut oil for years, and I ran across your scrub recipe when looking for more ways to use coconut oil for skin. I did whip my coconut oil with 2 tbls RealLemon (since I had no lemons on hand) with the hand mixer until fluffy, and I pulsed the sugar in the coffee bean grinder for a few seconds to get a finer grain. Whipped it all with the hand mixer once combined. It made a wonderful, fluffy scrub! We certainly enjoyed licking the beaters, too! Thanks for a great recipe! I was wondering if lemon juice and baking soda would work as a scrub? I’ve never tried it, but it seems like undilueted lemon juice would be too harsh for your skin. Use fractionated coconut oil and it wont solidify.